The Office has kind of lost its shine for me post-Michael Scott. But I did catch the recent episode wherein Pam heads off to a job interview with a resume that, as she says, could fit on a post-it note. Promotion. Didn’t she land herself a promotion and create the office’s first-ever Office Manager position? 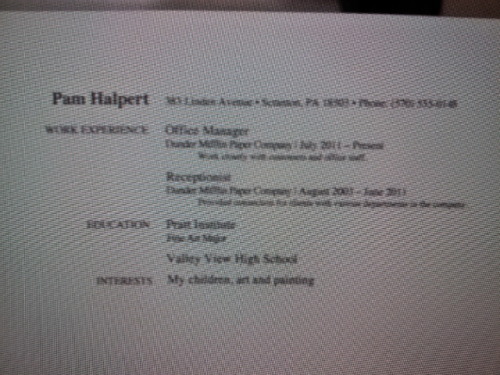 That’s great resume material. Artwork. Though her artwork isn’t directly relevant to her current job target, she could mention her side-business painting murals, her art exhibits, and her recent commission to add interest to her resume. I encounter many people who, like Pam, chronically sell themselves short and shy away from opportunities because of fear of the unknown. Creating a strong resume is a great morale booster and a great way to remind yourself of all you’ve accomplished.